Within the realm of “adaptationland”, a small suburb within hollywood, video games have been the underdog when we are talking about becoming a movie. Will this change as Duncan Jones, a young director with one of the most interesting carers around has his take on the field? To download the podcast about Warcraft, click here. For listenint, you can do it on the player below. You can suscribe to our podcast via iTunes clicking on this link. You can also listen or download it directly on your mobile phoneusing Player.fm , Spreaker or even Soundcloud. In case that you'd rather listen to it on my beautiful Spanish, leave your message on the comments section or at Facebook. Ah! and you can also find us at Stitcher, Tune In, Acast , Poddirectory or even iVoox. The end of the world is nigh. While the last survivors are preparing to start a mass exodus to a habitable planet, we get to know the story of Durotan (Toby Kebbell), one of the leaders who will be in the first group sent to begin the colonization of a new planet. His wife is expecting a child and this is more than enough motivation for Durotan to try and literally leave a better world for his son. The problem? The world into which they arrive is Azeroth, populated by small and fragile beings known as humans, which will serve as fuel to allow more Orcs (as Durotan) to cross the portal that separates their worlds and can save them from destruction. Warcraft (the movie) is based on the popular Blizzard game series, and it focuses on the first meeting between these worlds. It is a story set in a fantastic world, so there is no shortage of comparisons with movies like Lord of the Rings, but the way the story is handled is way different. While the game has inspired several novels, comics and various other games, it is based on the story of the first game: Warcraft: Orcs and Humans, but with an interesting twist. Instead of focusing on the typical story of good versus evil (evil usually being any character that doesn’t look like a human), it gives different shades and characterizations. The invaders that arrive to the kingdom of Azeroth are a violent horde, but that has to do with its social structure that reminds us of the barbarian invasions of Europe and the Viking themselves, and the participants do not necessarily seek conquest nor manipulation but rather survival. The final story is a mix between the basics of the game and a pair of novels, being Rise of the Horde and The Last Guardian what forms the main plot. While in video games you can make simplistic plot work and have hours and hours of entertainment, it is difficult to adapt this type of narrative to the big screen. Outside the Resident Evil films, there are a handful of adaptations that have been commercially successful and we tend to remember films like Street Fighter, Mortal Kombat or Mario Bros where the simplistic story line does not evolve when it changes the medium. Warcraft as a project is more ambitious and this comes from the source, especially considering that Blizzard in the realm of videogames has always been known for having the best cinematics in their sagas, but that does not necessarily mean that besides the visual style they can be fulfilling. The development of this project directed by Duncan Jones (who previously gave us two brilliant films with Moon and Source Code) went through several stages before reaching the son of the late David Bowie. Uwe Boll originally contacted Blizzard to direct a film based on the game but was rejected because the company did not trust his directorial capabilities. Some time later it was confirmed that Sam Raimi would be the director, but left the project to create his version of Oz: the great and powerful. Finally Jones comes to the project, who after reviewing the script by Charles Leavitt makes changes to the story so it it’s less "we're the good guys and them, who hardly speak, are the bad ones", which is noticeable in the final film, being one of its main strengths. For the film, the strongest point is the direction given by Duncan Jones. His vision helps not only to balance the factions of the characters from the original script, but to implement a large number of visual effects and computer generated graphics in a story that unfolds mostly in front of a green screen. Unfortunately the handling of such technology can be a nuisance to the viewer. Without falling into creating unreal and highly stylized environments like the ones used in 300 (by Zack Snyder), the film seeks integration with what appears to be real. The costume design and scenery is brilliantly adapted from what was created by Blizzard for their games, but at the moment you see it in real action… well, it looks kind of ridiculous. Exaggerated and impractical armor that is taken straight out of the game or a fantasy book, looks more uncomfortable than the woolen sweater knitted by a well-meaning aunt. The same applies to the integration of scenarios and while the animated characters look good, they do not quite fully integrate with actors made with flesh and blood. This could be justified in part because the animation style looks straight out of a Blizzard game, which usually looks better than reality itself. What about the performances? The main cast consists of a Travis Fimmel presented as an extension of Ragnar Lothbrok, the character he plays in Vikings. This is probably due to the type of character he’s presenting, wich by himself can’t bring many nuances that can help to display a better performance. In contrast, Toby Kebbell’s Durotan feels much more human and approachable, despite being a character created entirely by computer. 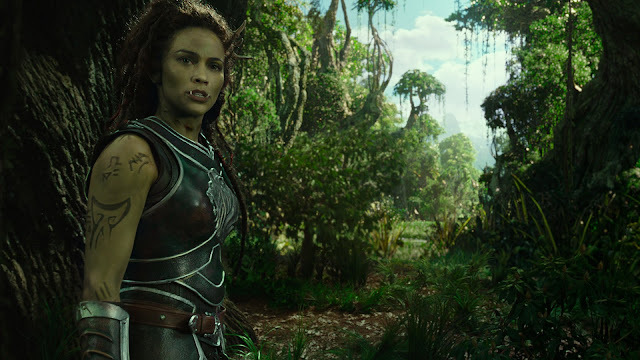 Interestingly, the midpoint is presented with Paula Patton, actress interpreting Garona, a hybrid of both races which in turn represents the best approach to a film that mainly depends on the work of computer generated images. Instead of being a character driven by motion capture (as Durotan), Paula is herself with makeup and prostetics. The reception of the film was quite negative in their country of origin, which contrasted with his overwhelming debut in China, which puts it as a case study that anticipates what will be the game of international markets in a couple of years, the results at the american box office will go into a second place when the international box office is important enough to justify the creation of more movies. Similar to the way Blizzard makes it’s games, Warcraft works as entertainment and the way it manages its storytelling (with all its various defects) achieves an approach to the adventure we had not seen in a long time. Interestingly their greatest virtues can also be considered their main defects. Being an adaptation enriched by stories only known by a small ghetto, it has to make concessions to appeal to a wider audience. Unfortunately that will not prevent people from making unfair comparisons with films like the Lord of the Rings Saga, despising Duncan Jones efforts. This comparison should be ignored considering the sources of both adaptations, as the narrative strengths of Tolkien have nothing to do with the handling of rhythm and sense of adventure you get in Warcraft. Or do you really want to see three-quarters of a film with walking-talking-trees so that you can feel intellectually superior after seeing the movie and know the differences with the book? In contrast, Warcraft, once you decide to enter his universe, takes you in an attractive way and when it ends, it leaves you wanting to see it’s sequel. It fulfills the purpose for which it was created, and it would be fascinating to see Duncan Jones’s vision again. He has shown that rather than being a fan of the series, he has respect to the material and dares to bring you more with the great amount of details that are not only accessible to the niche that saw the origin of the saga. I bet few of you know that there is a scene in which the character of Khadgar (played by Ben Schnetzer) walks to a bookshelf and takes the Necronomicon Ex-Mortis, as a tribute to the director who was in charge of this adaptation before Jones.